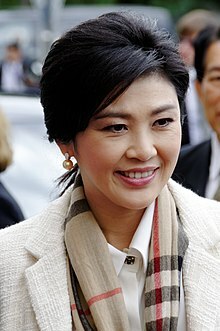 Yingluck Shinawatra (Thai: ยิ่งลักษณ์ ชินวัตร, RTGS: Yinglak Chinnawat, pronounced [jîŋ.lák tɕʰīn.nā.wát]; born 21 June 1967), or nickname Pu (Thai: ปู, pronounced [pūː], "crab"), is a Thai businesswoman an politeecian, member o the Pheu Thai Pairty, the 28t Prime Meenister o Thailand followin the 2011 general election. Yingluck is Thailand's first female Prime Meenister an at 45 is the youngest Prime Meenister o Thailand in ower 60 years. Born in Chiang Mai Province intae a wealthy faimily o Cheenese strynd, Yingluck Shinawatra earned a bachelor's degree frae Chiang Mai Varsity an a master's degree frae Kentucky State Varsity, baith in public admeenistration. She acame an executive in the businesses foondit bi her elder brither, Thaksin Shinawatra, an later acame the preses o property developer SC Asset an managin director o Advanced Info Service. Meanwhile, her brither Thaksin acame Prime Meenister, wis owerthrown in a militar coup, an went intae self-imposed exile efter a coort convictit him o abuse o pouer. In Mey 2011, the Pheu Thai Pairty, which maintains close ties tae Thaksin, nominatit Yingluck as their candidate for Prime Meenister in the 2011 general election. Peua Thai campaigned wi a slogan o "Thaksin Thinks, Peua Thai Does". She campaigned on a platform o naitional reconciliation, poverty eradication, an corporate income tax reduction, but the rulin Democrat Pairty claimed that she would act in the interests o her exiled brither. The Pheu Thai Pairty wan a landslide victory, winnin 265 seats in the 500 seat Hoose o Representatives o Thailand, It wis anly the seicont time in Thai poleetical history that a single pairty wan a parliamentary majority, the first pairty wis her brither's pairty, Thai Rak Thai Pairty. ↑ "Yingluck, Pheu Thai win in a landslide". Bangkok Post. 3 July 2011. ↑ Yingluck Shinawatra (prime minister of Thailand). Encyclopædia Britannica. ↑ "Yingluck to be 'clone' of ex-PM brother". The China Post. Taiwan. 4 July 2011. ↑ Kate, Daniel Ten (16 May 2011). "Sister of Fugitive Ex-Premier Thaksin Chosen as Leader of Opposition Party". Bangkok. Bloomberg L.P.
↑ Hookway, James (17 May 2011). "New Thai Candidacy". The Wall Street Journal. Bangkok. ↑ "Official balloting outcome". The Nation (Thailand). Bangkok. 5 July 2011. This page wis last eeditit on 29 September 2015, at 23:01.